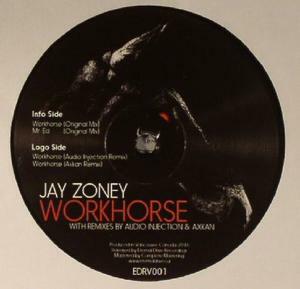 Eternal Drive Recordings is proud to present it’s first vinyl release by Jay Zoney titled “Workhorse” with remixes by Audio Injection & Axkan. ´This is the label’s eleventh digital release and first to be cut on vinyl featuring two original tracks from label boss Jay Zoney. On remix duty is Audio Injection and Axkan. First on the EP is the title track “Workhorse,” which true to its name is steady and relentless. A kick drum that stamps like heavy hooves on concrete gives it a powerful sound. The fast flowing percussion is brought to life with startling rips and synth stabs that grunt with determination and grit. This industrial workhorse delivers the goods every time with expert precision and perfect timing. “Mr. Ed” shows Jay Zoney’s acid roots. Industrial like the first track, it’s hard hitting with a rolling acid line that wriggles and twists as the track progresses. It has an intensely powerful clap with sharp hi-hats and a shuddering bass sound that when combined give it an infectious throwback groove. Third on the release is the Audio Injection remix of Workhorse, and although dark like the original, it’s less industrial overall. Opting for his own spacey percussion and bassline David (Audio Injection) creates a rolling groove packed with forward momentum. With the addition of a half bar synth hook and rising pad sound, this remix is powered by a prominent off beat hi-hat which makes it both hypnotic, euphoric and menacing. Axkan’s rework of Workhors is both eerie and mysterious. Loaded by a grinding synth sound which echoes round the mix to create the feeling of open space, his remix starts off four to the floor, but with an unexpected shift morphs into a more broken rhythm. Building in intensity, this pulsating masterpiece has mechanical qualities and a truly individual sound.